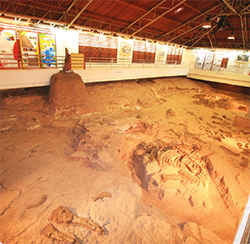 Sirindhorn Museum is located in Kalasin province, a significant dinosaur fossil excavation site in the Northeast of Thailand. The Kalasin province is also well known for its Phuthai culture, Phraewa silk, and Lampao reservoir. 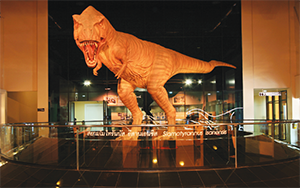 The museum is the first dinosaur fossil museum in Thailand establishing for the purposes of study and research, preserving the fossils as references, and geological tourism. 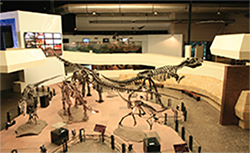 The museum is composed of a research building for dinosaur fossils and others vertebrate, and an exhibition building, and is opened to public. The museum makes many impressive records including the largest fossil collection rooms in the Southeast Asia. The museum is approximately 34 kilometres north of Kalasin province. Accessibility is possible by the highway no.227. Just 3 kilometres before Sahatsakhan district turn right to Wat Sakawan, visitors can see the diversity of dinosaur models standing to welcome in front of the museum. Phra Kru Vijitsahassakun, the abbot of Wat Sakawan, found dinosaur fossils at Phu Kum Khao, Sahassakhan district, Kalasin Province in 1994. 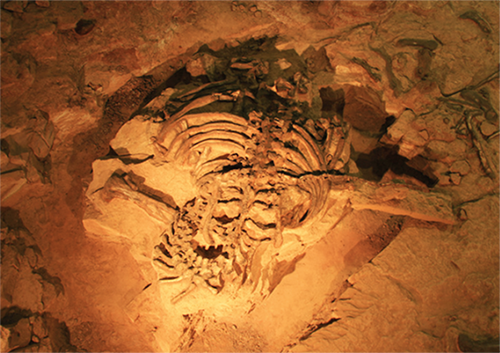 Department of Mineral Resources researchers excavated the fossils later the same year and found that Phu Kum Khao is the complete herbivore dinosaur site in Thailand. 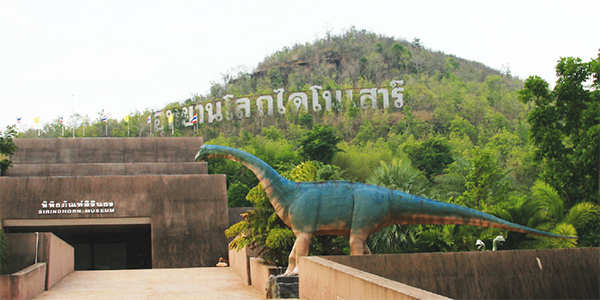 The museum project started in 1995 due to the discovery of dinosaur fossils at Wat Sakkawan. The fossils discover is a prime evidence for study and research and can be used as world class references since they are new species and kinds. HRH Princess Maha Chakri Sirindhorn presided over the opening ceremony of the museum on 9 December 1998. 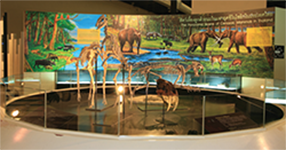 Since then, the museum has served as the palaeontology research and education center, fossils preservation location, permanent museum with light and sound artistry as well as library and conference halls. Life first evolved after the meteorite collision with the Earth and volcanic eruption. Living things are enormously complex and originated in a series of small steps. Geotectonic and geological time scale in the museum helps explain the significant evolutions. Life began in the ocean but eventually transitioned onto land, and by the late Paleozoic. Towards the end of the era, large, sophisticated reptiles were dominant and the first modern plants appeared. Pangaea was a supercontinent that existed during the Late Paleozoic and Early Mesozoic eras. Warm climate and deserts in the inland regions of supercontinent led to the origin of reptiles. As Pangaea drifted, it started to show signs of breaking apart. Many older reptiles disappeared in several mass extinctions, giving way to new species. The most successful of these were the dinosaurs that evolved. They spread to every continent and occupied every environment. The earliest mammals also evolved at this time. A variety of dinosaurs such as The ropodsorcarnivorous dinosaur, Sauropod and Psittacosaurus or herbivorous dinosaurs lived in Thailand during Mesozoic era. 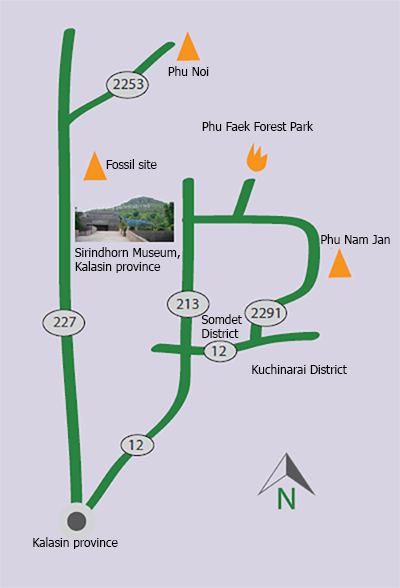 The exhibition room demonstrates all types of dinosaur fossils found in Thailand. Phu Kum Khao help us to understand dinosaur life despites its extinction 65 million years ago. The visitors can see the working process in the largest laboratory in the region as well as the dinosaur fossils collections.